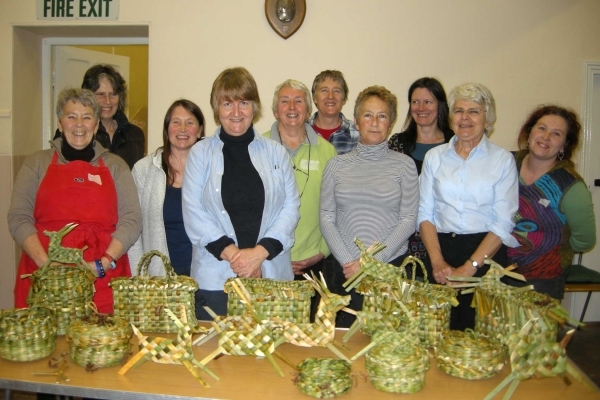 One drizzly Sunday in November, NBG members got together, under the expert tutilage of Liz Balfour, to have our first go at making rush baskets with East Anglian rush. 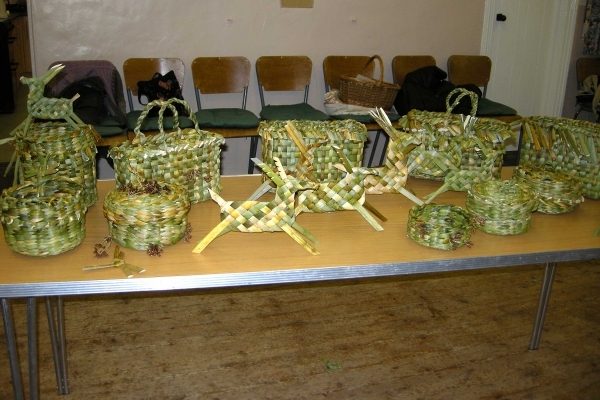 Liz had an impressive range of items she had made using different techniques.We were surprised at how quickly and easily the material was made workable, how soft it was on our hands compared to willow, and how quickly we all managed to finish very passable baskets (see photo). With Christmas in sight we also learnt to make rush reindeer. We were all very keen to have Liz back in the Spring to advance our skills. The rush we are using is a member of the Scirpus family, a tall slender plant growing in the river water. It has a little flower head at the top of the leaf and the leaf is whole without any nodes or breaks. It is harvested in summer when green and then kept to dry out in a cool dark place. It is damped down for use. Rush can be damped by sprinkling with water from a watering can, showering with cold water or soaking in a bath. It then needs to be wrapped and mellowed. There are no hard and fast rules for these processes as rush is a natural material which varies from place to place and year to year. It is best to start with the minimum of damping and mellowing - a quick shower and an hour wrapped in a blanket or towel - and increase until the right balance is found. Damp only what you can use in a day. Rush seems to grow in few rivers in Britain now and I have been told that modern river management means that most beds have been cleared out rather than harvested. This keeps rivers flowing faster, perhaps faster than Mother Nature intended. Some people think that many of the problems we have with flooding are caused because we have done away with natural sponges like rush and moss which once mopped up surplus water. Rush was used to make baskets, chair seats, matting and mattresses in the past and there are still rush workers who keep alive these traditions particularly in East Anglia and Ireland. 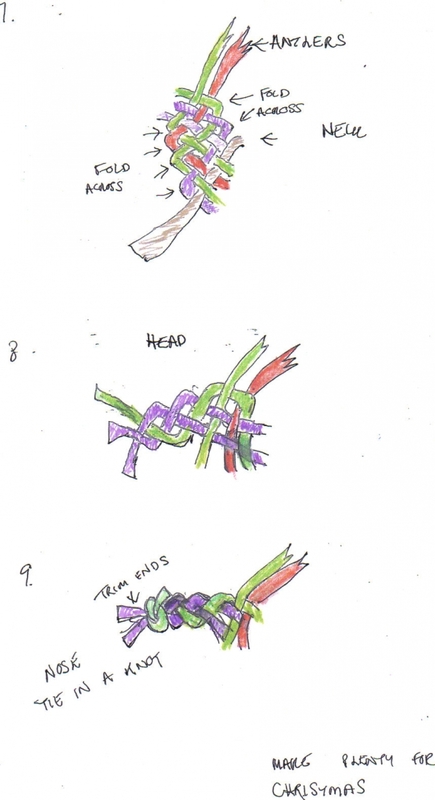 In Ireland rush was used to make decorations as well as useful items in particular the St. Bridget or Bride's Cross. This was a talisman made every year at the end of the winter and kept in the house. A three legged cross was made for the byre or stable. 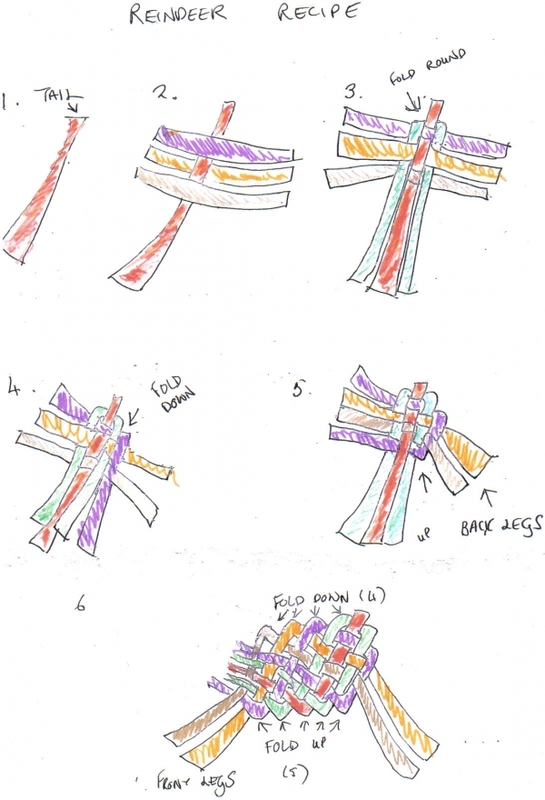 There are several ways of making the cross and I use the Sligo method. Juncus Effuses is the field rush which grows in damp and boggy places. It was used in rural communities to make rush rope and this was known in Scotland as flossy simmens. It was a sturdy twine and used in the construction of the Shetland kishies and buddies - back creels and storage baskets. The rush was harvested when green and allowed to dry out. Then it was damped again for use and a few rushes at a time twisted into a narrow 2 ply strand which could be used for many farm or household purposes. It was not very good for securing cattle or horses as they liked to eat it. Field rush was also widely used to provide a wick for candles or for a rush or watchlight. The rush was picked and the outside green skin carefully peeled away. The soft pith was dried and used as candle wicking or soaked in any kind of fat or grease. This was then burned as a candle giving out useful light before the advent of gas or electricity. Hedgerow or other materials can be used with rush work techniques - broad leafed plants like iris or montbretia are suitable. These techniques also lend themselves to recycled materials - packing tape, cardboard, newspaper etc. Rush grows in many countries and the different varieties have different qualities. English rush tends to have a very good colour and to be soft, pliable and broad. Dutch rush tends to be more even and hard skinned and travels well. It is excellent for chair seating particularly the variety known as Saltgrass. There is a Chinese rush which is imported as pre-coiled rope and this is also useful for chair seating. All of these require some experimentation to find the right amount of soaking and mellowing to render them workable. Rush is often strengthened by being coiled, plaited or roped before being sewn together. It needs to be handled as little as possible when dry but can be treated quite firmly once wet. When it is broken it is difficult to deal with and has to be sorted so that short lengths can be used in decorative items eg. Christmas Deer, St Bridget's Crosses etc. There are few rush suppliers and you have to order very well in advance to assure supplies. They harvest in summer so this is when they are busiest and it's good to place orders beforehand for the fresh crop. I don't think suppliers realise quite how much damage is caused by careless handling in transit and it is worth asking them to bundle it very securely. I tie two or three bundles together to a hazel pole with several ties in order to try and keep the rushes from being broken once it has arrived. suppliers. Sewing is done with a sacking needle and a leatherworker's palm protector is useful. A hammer and tacks may be used and masking tape is always handy. A variety of moulds can be used and the wood blocks used by wood turners are excellent as they have just the right rough texture to grip the rush. The rush can be nailed on. It is easy to improvise moulds of any shape using cardboard wrapped in cling film or masking tape. Hat blocks are very expensive and I once taught a milliner who made a wonderful rush top hat - she had bought the mould for the top of the hat, her friend the brim mould. I have started using plastic containers as they are light and easy to obtain and these work very well as long as you make sure the rush dries out quickly on the mould. An attractive item to make is a rush basket for a casserole as this can be made using the dish itself as a mould. Plaiting and sewing rush makes for a sturdy basket but is time consuming and heavy on rush and I do not anticipate doing this on this particular course unless people have brought their own rush along with them.